1. What is the maximum solids concentration that can be achieved? Normally, outlet slurry concentrations fall into the range of 1-2 pounds of solids per gallon of liquid. This is largely dependent on the solid’s bulk density, solubility, and flow characteristics. 2. What’s the single most important factor in determining whether a slurry eductor can work for my application? Discharge piping geometry. Reduce the vertical lift, reduce the number of elbows, increase the pipe size if possible–in other words, minimize overall pressure drop through the system. 3. How should the eductor be fed? Slurry eductors should always be fed in such a way as to prevent the feed hopper from completely filling. 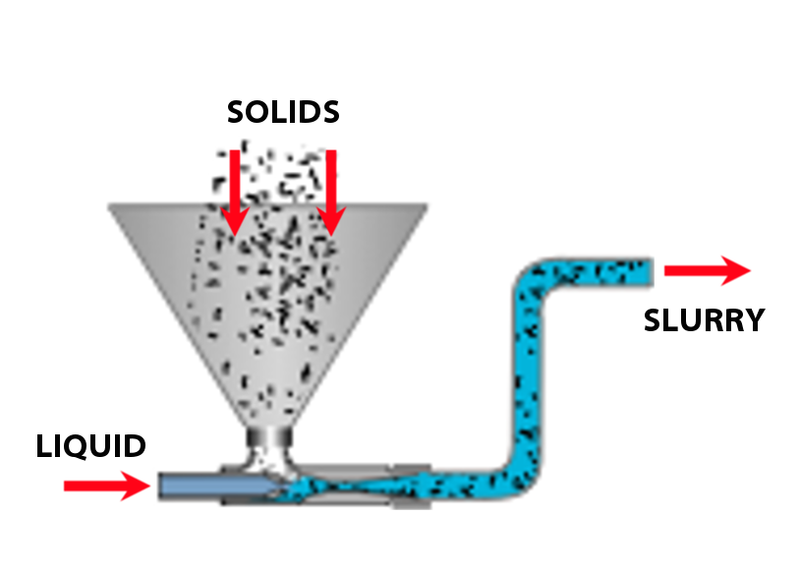 Flood feeding can sometimes cause overflow and spills if the hopper is not specifically designed to avoid bridging or clogging. 4. When is washdown on the solids feed hopper required? Whenever mass flow rates are relatively high or discharge piping is either long, or has significant vertical lift, or both. 5. Why are slurry eductors without washdown so sensitive to discharge pressure? 6. What’s the effect of the viscosity of the motive fluid? What about the viscosity of the discharged mixture or slurry? If motive fluid viscosity is over 600 ssu (200 centipoise), solids suction flow is greatly reduced and becomes unpredictable. Discharge viscosity has a dramatic effect on performance, since viscosity is directly related to pressure losses downstream. 7. 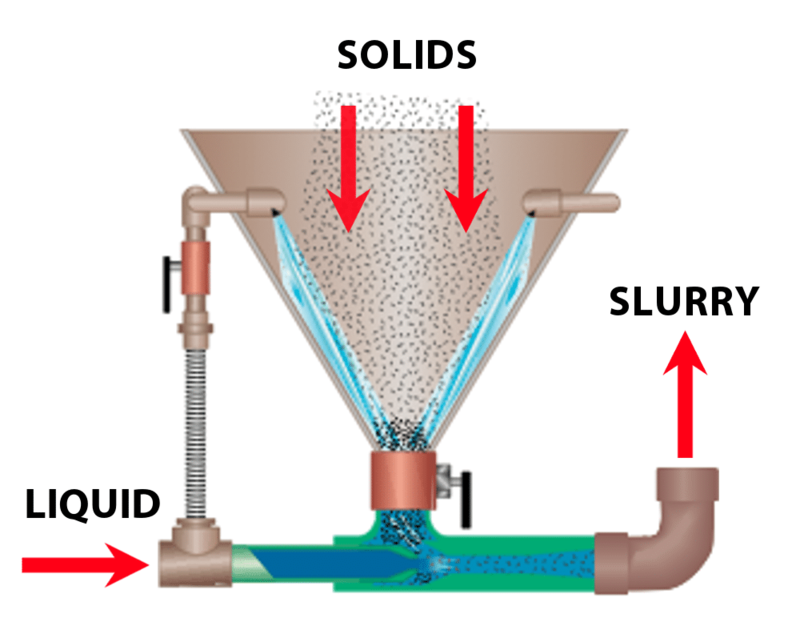 Can a slurry be recirculated to increase the solids/liquid concentration? Only with completely nonabrasive solids. High velocity in the motive nozzle would result in very rapid wear if any abrasive slurry is recirculated. 8. When and why is a valve necessary between the feed hopper and the eductor suction port? This valve prevents the contents of the discharge line from backing up into the feed hopper. It is used during startup and shutdown in cases where the discharge line is at a higher elevation than the eductor. This valve eliminates the use of check valves, which can be troublesome if solids are present. 9. When can a conventional, 90° type of slurry eductor NOT be used, and only a coaxial slurry eductor can work? Hard-to-wet powders such as polymers, emulsifiers, Carbopol, and guar gum require a special edcutor that will quckly and completely hydrate the powders to prevent the formation of clumps and fish-eyes . 10. What line velocity should be used in the discharge piping? Velocity should be: a) Low enough to minimize P through the convey line, but b) High enough to keep undissolved solids in suspension. Generally, 6-8 ft/sec is adequate.